5 shows in Tôkyô (Kabukiza, National Theatre, Warehouse TERRADA, Shinjuku FACE) and 1 in Kyôtango (Tango Bunka Kaikan)! Living National Treasure Onoe Kikugorô, Living National Treasure Nakamura Kichiemon, Ichikawa Ebizô, Nakamura Jakuemon, Nakamura Tokizô, Onoe Kikunosuke, Onoe Shôroku, Ichikawa Sadanji, Ichikawa Udanji, Ichikawa Danzô, Bandô Rakuzen, Nakamura Karoku, Nakamura Matagorô, Nakamura Baishi, Onoe Matsuya, Kataoka Ichizô and Bandô Hikosaburô perform at the Kabukiza! The Zenshinza troupe performs at the National Theatre! Living National Treasure Bandô Tamasaburô performs at the Tango Bunka Kaikan! 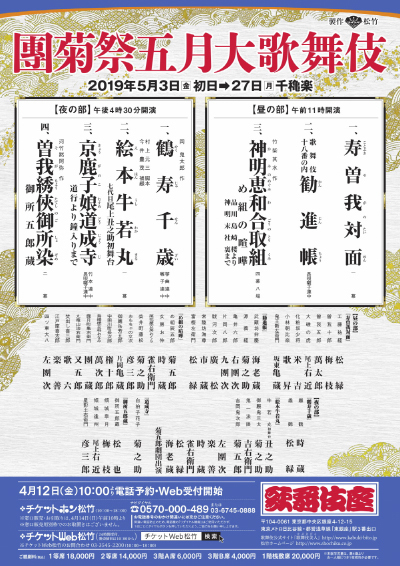 The great yearly Dankiku festival for the Naritaya and Otowaya guilds, which commemorates 2 great stars of the Meiji era: Dan = Ichikawa Danjûrô IX and Kiku = Onoe Kikugorô V. This is also the hatsubutai of Onoe Kikunosuke's son Terajima Kazufumi, who is also the grandson of both Living National Treasures Onoe Kikugorô and Nakamura Kichiemon. This young boy receives the name of Onoe Ushinosuke VII, a name unheld for 23 years, in May 2019 at the Kabukiza. The new Ushinosuke performs in the dance-drama "Ehon Ushiwakamaru", which was written by the novelist Murakami Genzô and was premiered in February 1984 for the hatsubutai of Onoe Ushinosuke VI. The usual Zenshinza May program at the National Theatre! A special Buyô program starring the amazing Living National Treasure onnagata Bandô Tamasaburô in Kyôtango at the Tango Bunka Kaikan (Tango Culture Center). A new type of Kabuki called Ofushiatâ Kabuki, literally "Off Theater Kabuki", staged at the Warehouse TERRADA and (loosely?) based on Chikamatsu Monzaemon's masterpiece "Abura no Jigoku". A new type of Kabuki called Ofushiatâ Kabuki, literally "Off Theater Kabuki", staged at the Shinjuku FACE and (loosely?) 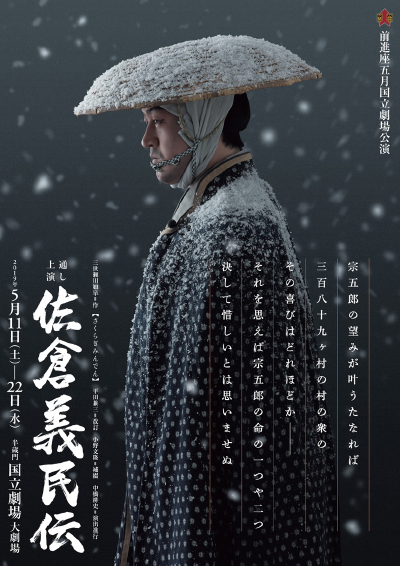 based on Chikamatsu Monzaemon's masterpiece "Abura no Jigoku".